Soffit & Fascia Replacement - Watershed Roofing | Free Quotes! Fascia is the flat horizontal band that goes around the edge of your roof. This board prohibits the whole roof from being subjected to water damage from weather, and it is also what the soffit and the eavestrough or gutter is attached. 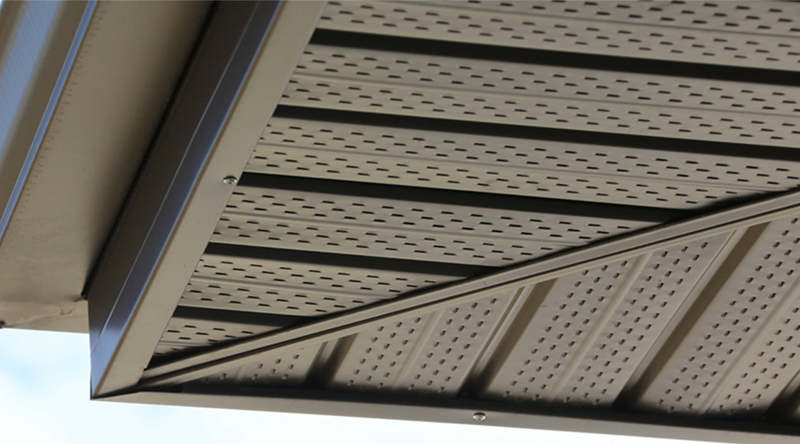 Soffit is the name for the perforated underside of the eaves. Soffit is a part of the gutter system, arguably one of the most important aspects, that assists in functions such as air circulation and keeping moisture away from the house, and provides air ventilation to keep moisture out of the roof and is the best way how to vent an attic. Why is Soffit and Fascia Important to a roof? Soffit and fascia are vital for improved circulation for the eaves and attic, and they also add a great polished look to your home. Soffits and fascia are the part of a roof’s structure closest to the gutters. These are the first line of defence when it comes to water damage coming from a clogged gutter. A sign that your soffit and fascia may need replacing is when you see discoloration and peeling paint, it can be a tell-tale sign that the soffits and fascia of your home have been damaged. Once damage has occurred, your soffits and fascia need the attention of a professional soffit and fascia company such as Watershed Roofing & Exteriors who can remove the old material and install new soffit and fascia. How do I know I should replace my soffit & fascia? Watershed Roofing only use the finest aluminum soffit and fascia. We offer a choice of styles and colours so that you can compliment your home’s existing look. Call us or email us any time Monday to Friday from 8am to 5pm. Our repair services are on call 24 hours a day, 7 days a week, 365 days a year.